The 5th edition of Graphene International Conference will take place in Bilbao (Spain) between the 10th and the 13th of March 2015. 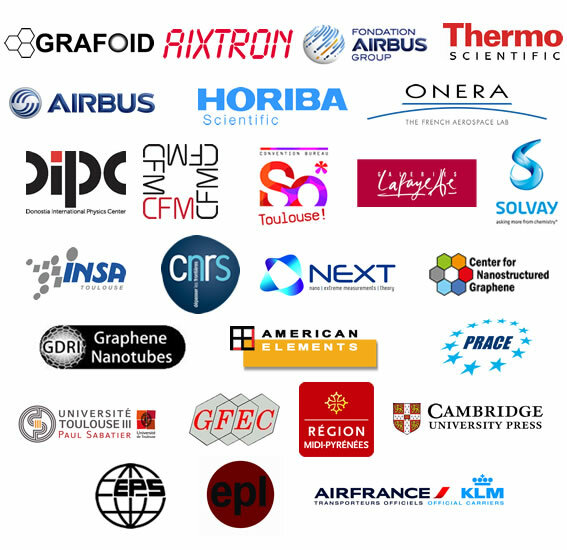 Toulouse (France) hosted the 4th edition of Graphene Conference series, the largest European Event in Graphene, from the 6th until the 9th of May 2014 at Centre de Congres Pierre Baudis. 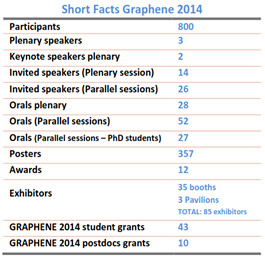 Graphene 2014 attracted 800 participants from 49 countries. For the 1st time there was an exhibition of Worldwide graphene research centers, apart from graphene producers, publishers, manufacturing equipment makers, graphene application developers, networks, and many others. On this edition 35 booths and 3 pavilions were featured with roughly 85 exhibitors represented. Exceptional electronic properties of this material, resulting in carrier mobilities as large as several thousands of cm²/Vs, make this material at the heart of the alternatives for the so-called beyond-CMOS nanoelectronics research. The current carrying capability of graphene is orders of magnitude higher than that of metals. Additionally, graphene is CMOS compatible and can be handled by standard planar technology, which should result in highest integration of device density in the medium run. Graphene devices are also believed to work at much lower supply voltages and should therefore result in lower power consumption. Therefore graphene has the potential to increase computing performance, functionality and communication speed far beyond the expected limits of conventional CMOS technology, which is related with large financial markets in the microelectronics business. Additionally, the reports of novel functionalities in graphene devices such as sensing capability, electro-mechanical effects (e.g. resonators) and spintronics effects also profile some new perspectives for innovative applications. 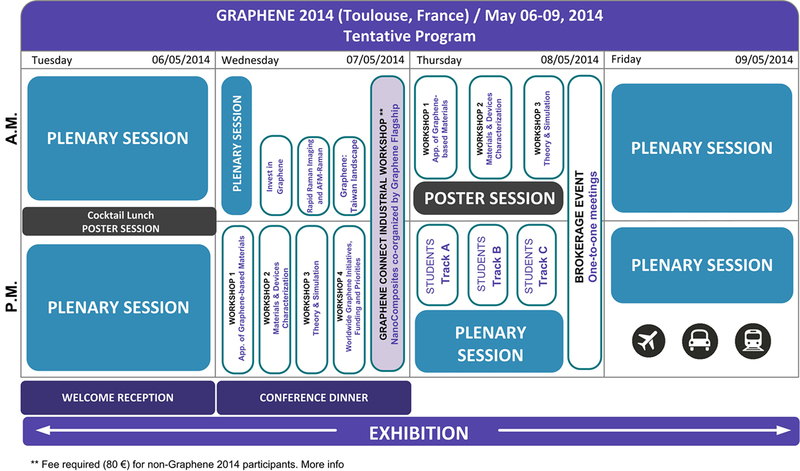 Those salient features will be at the heart of GRAPHENE 2014 that will present the state of the art of the field.